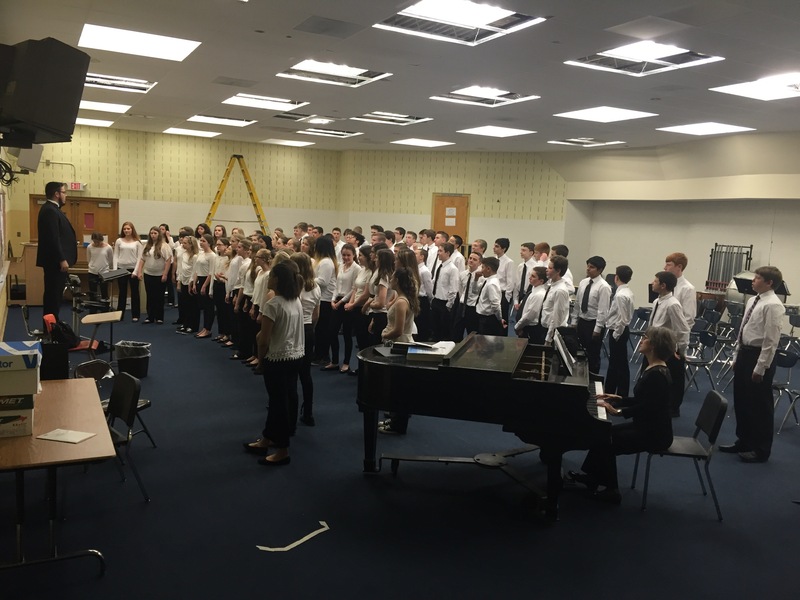 Learwood Eighth Grade Concert Choir to Perform at the OMEA Professional Development Conference! I hope you are all having wonderful summers. I am pleased to announce that the Learwood Eighth Grade Concert Choir was selected to perform at the Ohio Music Education Association’s Annual State Professional Development Conference which will be held at the convention center in Cleveland, OH. The conference will run Thursday February 2 through Saturday February 4 and OMEA will assign us our performance time and date. As I receive more details from OMEA, I will notify parents and students of details. There were over 150 applicants and few were selected to perform. It is a huge honor to perform at a conference such as this. Our audience will be mostly music educators from around the state and even other states. This is the same conference where OMEA features their high school all state ensembles. This performance will advocate to the music community our great music program Avon Lake has to offer students. You will see an updated handbook and calendar posted to the website sometime next week. A huge thank you to our 2015-2016 Concert Choir for their awesome recordings we used in our application! Congratulations to all of our students who dedicated their time, energy, talents and performed their best in the Spring Choral Concert! Every choir’s performance brought great joy in my heart. I am especially proud of our 8th grader’s hard work they put into making Amour Vincet Omnia a piece to remember. Donna Widener would like me to share her gratitude to you all. Dr. Philip Silvey was in tears hearing his piece and hearing the audience’s reaction. Again, a huge thank you to Dr. Silvey and everything he brought to our students. A special thank you to our HS Teacher Assistant Mr. Ben McComas for making the end of the year special for students and a huge help in assisting me with details for the concert. Below are some pictures taken at the concert. I will have videos uploaded from the concert in the next few weeks. Thanks to the Learwood PTA with my new iMac, I can edit videos and upload even faster then before! I hope everyone has a safe and happy summer break! Parents, THANK YOU for everything you do to support the Learwood Choirs. If you wish to unsubscribe to my emails/posts, please press unsubscribe at the bottom of this message. Some last minute reminders for tonight’s concert! Please look at handbook for dress code policy. Please review with your son/daughter the importance of being a professional musician on stage meaning NO TALKING, Staying focused and standing still at all times. Walk on and off the stage with class and maturity. Students cell phones must be turned OFF during performance. Concert should be over around 8:45 p.m. All students are required to watch the concert backstage and parents please stay to watch the concert until the end. If you must leave early, please make your way backstage in between choirs moving and pick up your son/daughter in their designated room. Divine Scoops is staying open late after the concert so go treat yourself on this hot day! Congratulations to everyone involved! This video will also be available under our media page. Congratulations to the Learwood 8th Grade Concert Choir for a beatiful performance at the Ohio Music Education Association District IV large group adjudication! The concert choir performed three selections for three clinicians. The concert choir received on a rating scale of I-V (I being superior and V being poor) straight Superior (I) ratings! Feedback from this event is used for our progress as a musical ensemble and for students individual growth as a musician. We will be listening for our comments as to help improve our performance before our spring concert. Learwood A Cappella and Learwood Jazz Band will be on Channel 19 Action News! 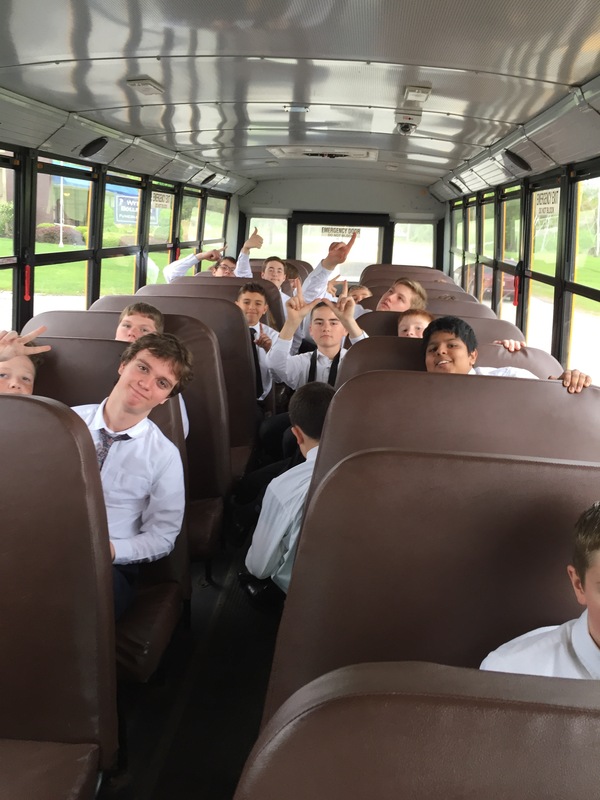 Congratulations to the Learwood A Cappella Ensemble and the Jazz Band as they will be performing on the news this Monday morning, May 16th for Channel 19 Action News! Channel 19 is coming to do their weather portions of the news broadcast at Learwood. The A Cappella Ensemble and Jazz Band should be performing during the 7:00 news hour. We could perform as early as 6:45 a.m. Tune in! The Learwood Spring Choral Concert is approaching us rather quickly! The Concert is Wednesday, May 25 at 7:30 p.m. Students will report at 6:45 p.m. The students have been working hard since January preparing for this concert! I am proud to announce this year’s concert theme entitled “Amour Vincet Omnia, Love Conquers All.” This theme is centered around a piece that was commissioned for the Learwood 8th grade mixed choir entitled “Amour Vincet Omnia.” This piece was written by a dear friend and colleague Dr. Philip Silvey who currently teaches at the Eastman School of Music. Dr. Silvey will be our composer in residence at Learwood from Monday, May 23-Wednesday May 25. I commissioned Dr. Silvey to write “Amour Vincet Omnia” based off of poetry of Rick Widener. Rick’s wife Donna Widener works on staff as an evening custodian. Donna cleans our music suite and I have become great friends with her. Two years ago, her husband Rick passed away. As I attended the viewing, I discovered that Rick was a poet and he had a book of his poems published “Amour Vincet Omnia Love Conquers All.” The poems were beautiful. A lot of the poems centered around love, but also talked about his childhood, nature, and the afterlife. I mailed the book to Dr. Silvey this past summer and he was able to create a beautiful piece that would sound great for the Learwood 8th Grade Mixed Choir. On Wednesday, May 25, Both Dr. Silvey and Mrs. Widener will be in attendance at the concert. In addition to “Amour Vincet Omnia” Each choir will perform a piece by Dr. Silvey. Along with the pieces composed by Dr. Silvey, there will be many pieces performed that will focus on love, nature, and self motivation. Music from the 1600’s all the way to Adele’s Hello. Yes. I had to throw in a break-up song if a concert is themed around love. Please refer to the Learwood Vocal Music Department Handbook to see what is considered an excused/unexcused absence, dress code, and other important information. Below I have listed all of the MANDATORY dates and times students need to be for their rehearsals. 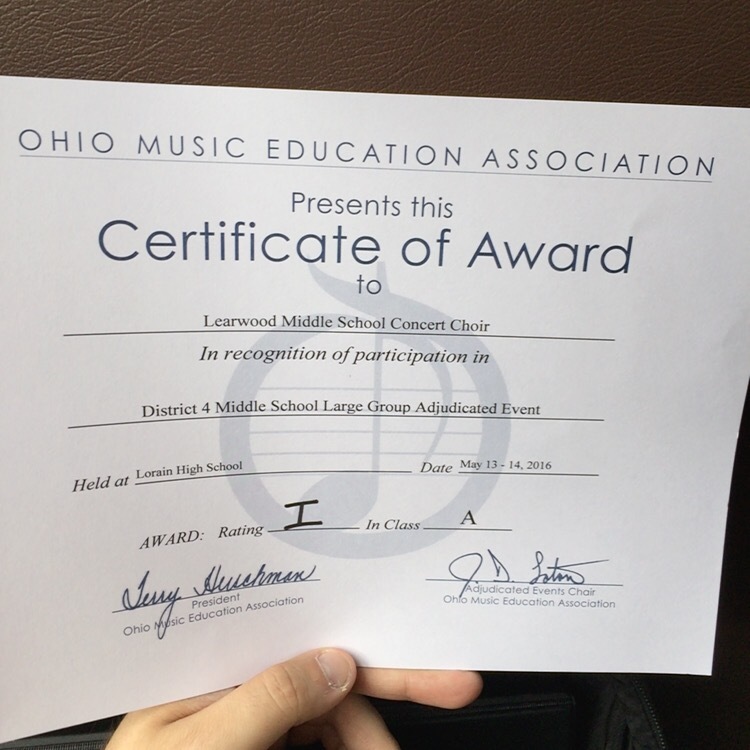 8th Grade Concert Choir OMEA District 4 Large Group Adjudicated Event Saturday May 14, 2016 Lorain High School 2270 E 42nd St Lorain OH 44055 Students report to Learwood at 7:30 a.m. I hope you enjoy our uplifting spring choral concert! Thank you for your constant support for the Learwood Choirs.